A few years ago people were saying we’ll have internet enabled coffee makers in the future… it is here, its been done! 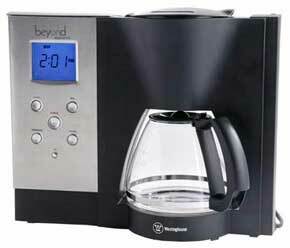 Westinghouse is releasing a $99 coffee maker which is part of their BEYOND line. It will feature a simple point-and-click web interface so you can schedule or start brewing coffee from anywhere in the world. You can even check the status… great for checking to see if a robber is still reading the morning paper and enjoying a warm cup of java.